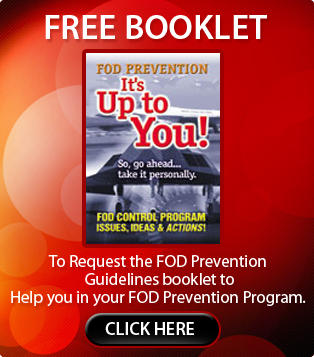 Need guidance for your facility’s FOD program? The Americas Aerospace Quality Standards Committee (AAQSC) has a new standard, AS 9146, which defines program requirements for organizations that supply aviation, space and defense products and services. Accident investigators concluded that last year’s nonfatal crash of a US Air Force B-52 bomber during an aborted takeoff on Guam was caused in part by a bird strike — that may or may not have actually happened. Read this interesting report detailing how debris found near a FlyBe Bombardier Q400 parked at Belfast City Airport was dismissed as irrelevant, then disappeared after a smoke incident prompted an evacuation. FOD Zone™ Marking Tape A long-lasting solution for designating specific zones — such as aisles, walkways, storage rooms, hangars or work flow areas — as sensitive to Foreign Object Debris/Damage.